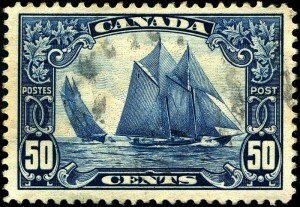 History – Sailing in Barbados and Canada. ‘Barbados and the wider Caribbean, Canada and indeed the United States are inextricably linked together as being the areas of the first British ventures into colonial enterprise. Starting with Newfoundland in the fifteenth century and Bermuda a little later, the mariners and merchant venturers of England colonized and populated most of the North American mainland and many of the offshore islands, and came later by conquest into possession of colonies originally settled by France. King George III also expressed the contemporary wisdom when he too indicated his belief in the superior value of the tropical islands as possessions rather than the often frozen wastes of undeveloped Canada. Fortunately, the United Empire Loyalists and the loyal colonies of Upper and Lower Canada and Atlantic coast did not hold preferences against him twenty years later! Since Voltaire and George III the situation has changed considerably; but over the years, as the relative importance of the West Indies vis-a-vis Canada has declined, a long history of warm and friendly relations has developed between the great country of Canada and the now for the most part independent island nations of the Caribbean. In the early days these relations were encouraged by the shared history of the colonies such as Bermuda and Barbados whose traditions were wholly English in background. The independence of the United States not only drew closer together the remaining English settlements in North America, but also those settlements with the Caribbean and other British colonies in the remainder of the Western Hemisphere. Trade relations developed early and the Atlantic provinces became suppliers of lumber and foodstuffs, notably salted cod and flour, to the Caribbean islands, taking in return sugar and rum.’ This trade was usually facilitated by the fast and ubiquitous fore and aft schooner developed in the Maritimes of Canada prominently for the fishing industry. It would not have been unusual for these schooners to be constructed on a timbered foreshore of New Brunswick, Nova Scotia or Newfoundland and then having been filled with a harvest of lumber from that same shore sailed and sold to commercial interests in the Caribbean and used thereafter as inter colonial cargo schooners trading among the island territories. Later after fishing vessels in the Canadian Maritime provinces turned to mechanical propulsion many of the old sailing schooners were retired from fishing to the Caribbean as cargo schooners. 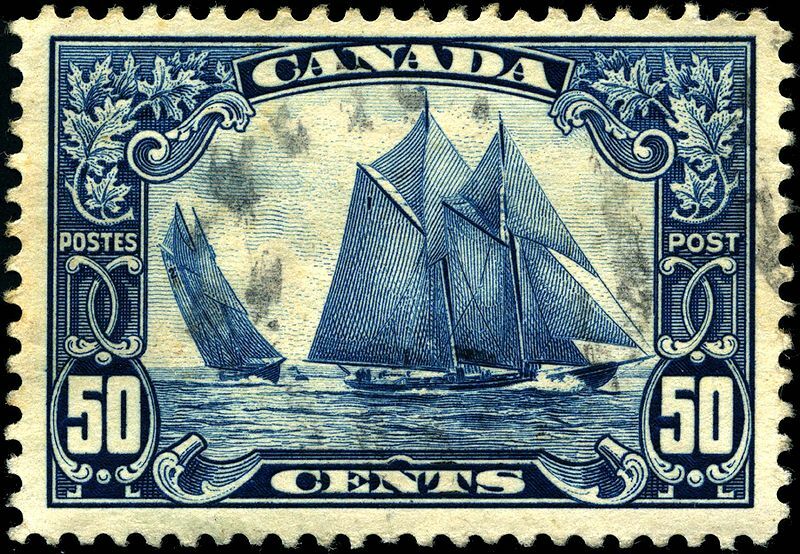 Indeed the sad truth is that the great ‘Bluenose’ of Lunenburg had her demise on an Haitian reef loaded with salt.To this day all small cargo ships plying the inter island trade routes regardless of their means of propulsion are known as “schooners”. It has probably been the Maritime provinces of Eastern Canada rather than the United States that has been the Americanising influence on the use of language in the English speaking islands, and joint membership first of the British Empire and now of the Commonwealth was carried to such extremes in Barbados that, until recently, a doctor who was qualified to practice in Canada was automatically admitted to practice in Barbados but one qualified in the United States other than the state of New York was not. Until relatively recent immigration legislation, a Canadian citizen ordinarily resident for 7 years in Barbados qualified as a “native of the Islands”, a privilege denied to a citizen of the United States and other non-commonwealth countries. And even now a Canadian citizen with the appropriate period of residence qualifies, along with other Commonwealth citizens, to vote in Barbados elections. One of the principal links between Canada and Barbados go back to the days when the great Commonwealth country of Canada provided a vital communications service for the Caribbean. The Canadian National Steamship Services, which for many years linked not only Canada with the Caribbean but the various territories of the region with one another. Whenever one of the “lady boats” as they were called by the vessels’ titles, came to Barbados, it became quite an occasion for many locals to become involved in all the activities that took place. Many Barbadians including school children, made several trips every year to one or other of the islands and it is often recalled how many people, from the highest to the lowest in the social scale, availed themselves of this means of travel. The only other modes of inter island transport of those days were the ever reliable sloops and schooners, which did a yeoman service for those who were prepared to brave the hazards and adventures of the sea on small sailing boats. The sea communication which Canada for so many years provided for Barbados and the Caribbean islands was perhaps the most dramatic indication of the mutual interests which bound together Canada and Barbados. The trading relationship went back to the eighteenth century and was in the classic pattern of two areas trading in complementary goods, exchanging northern products for those of the tropics. The consequent development of a Canadian shipping capacity to service this complementary trade thus owed a good deal to the West Indian connection. 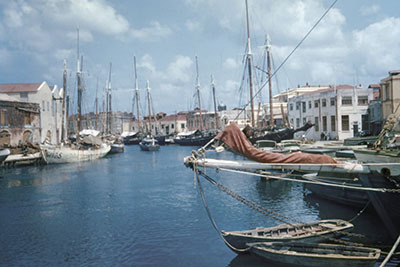 The trade association continued through the nineteenth century, and in the atmosphere of deliberate promotion of Empire trade in the earlier part of the twentieth century, a Canada-West Indies trade agreement was signed in 1925. The enabling legislation is still on the statute books of Barbados. While Canada continues to be among the major trading partners of Barbados as it has for over two hundred and fifty years it is in other fields of endeavour that the great association of Canada and Barbados thrives as well. In the political sphere Canada gave its support to the Federation of the West Indies experiment in 1958. Canada had gone through the difficult process of initiating a federation ninety years before and this had made it the only independent commonwealth country in the western hemisphere. The Canadian interest and support was wide spread. It was shown by government at more than one level, by academic institutions and by private citizens showing the generosity of spirit and approach that has characterised Canadians in their dealings with Barbados and the Caribbean. That support included Canada providing ten million dollars in Canadian aid including the giving of two passenger cargo ships, the Federal Palm and the Federal Maple. These ships represented then and subsequently the only regular shipping connection between the constituent parts of the Federation. There is no doubt whatever that the dissolution of the West Indies Federation after a short existence of four years was regarded by the peoples of Canada and the West Indies as a tragedy of the first magnitude. Amid all the ruin that threatened the West Indies at that time one vital thing survived – the warm and personal friendships created during those vibrant years. Governor General Vincent Massey, paid frequent visits to the Island as have Prime Minister Diefenbaker and subsequent Canadian Prime Ministers Pierre Trudeau, John Turner, Brian Mulroney, Jean Chretien and Paul Martin who have been good friends to Barbados and have spent many vacations in the island. With the passing of the years there has been no diminution in the interest of Canada in the welfare of Barbados and other territories of the Commonwealth Caribbean. Shipping links from Halifax and Montreal to Barbados and Trinidad have replaced the Canadian National Steamships. Canadian airlines , scheduled and charter, are especially busy during the winter season bringing 100,000 Canadian visitors to Barbados last year who have not only contributed to the foreign currency earnings of the island but with characteristic Canadian spirit have helped to promote friendly relations between all classes of the Barbadian society and indeed have played a notable part in breaking down racial barriers and promoting harmony among all sorts and conditions of Barbadian peoples. This is the benefit the Canadian people, of both French and English origin, have brought to Barbados in the field of tourism, a benefit that has proved of incalculable value to a society that was until recent times one of the most socially stratified in the region. In addition to the Canadians who visit Barbados, the Government of Canada has assisted Barbados tourist development through the Canadian International Development Agency including grants and loans, many forgiven, for such diverse investments as Airport Development and Fisheries rationalization. Indeed the construction of Grantley Adams Airport Terminal building of which all Barbadians are proud was financed by CIDA in addition to several other infrastructural projects. The Canadian private sector continues to invest in Barbados. Canadian banks, insurance companies and construction firms are all established in the island, some of them for a very long time. Barbadians continue to secure employment on a seasonal basis with Canadian farmers and other traditional occupations. In addition to migrant workers, Canada has also absorbed considerable numbers of semi-permanent and permanent immigrants from Barbados. Barbadians teach at Canadian universities, work in businesses and the professions, are employed as engineers, secretaries and in other areas where Canada needs skills. It may be that there are as many Barbadian doctors in North America as there are in Barbados. Strengthening this historic relationship today there are over 200 Canadian companies operating in Barbados. Canadian-Barbadian joint ventures and tech companies, entertainment and the arts are all represented employing many Barbadians and with their Canadian counterparts who work and reside in Barbados making outsize contributions to the Barbadian mosaic. The traditional friendship of Canada and Barbados is probably also cemented by the existence of so many Barbadians living in Canada, enjoying all that is good and decent and progressive in Canadian society. It should come as no surprise therefore that many Barbadians see their future firmly bound to the progress made by Canada. We hope that in launching and operating the Schooner Ruth, a Lunenburg Schooner built on the beach in Barbados by craftsmen and women of Barbados and the wider Caribbean and young Canadians of unabashed enthusiasm and work ethic, we honour the first Canadian mariners and merchant traders of the historic past. We thank and salute the expatriate Canadian banking, insurance , high tech and transport companies and rivers of Canadian tourists and residents and their Government who continue to contribute to the richness of the Barbadian cultural and commercial mosaic to this day. It is intended that Schooner Ruth ,named for an indefatigable daughter of the Canadian Maritimes, will replicate those historic trading adventures of the past, will provide traditional sail training opportunities for young people, shall represent Barbadian brands in the region and around the world as a flagship and sailing ambassador for Barbados and shall celebrate the historic and rich linkage of the people of Barbados and Canada. * We refer to an address given by the late Prime Minister of Barbados The Right Honourable J.M.G.Adams to the Empire Club of Canada in Toronto on November 23, 1978 paraphrased and updated .